Let’s Interview; Shesez of Boundary Break! For the last six months or so, Shesez has been making some very interesting video game videos. Focused on secrets not normally seen by the player and covering everything from Smash Bros Brawl to Resident Evil 4, these videos have gained a lot of popularity in recent years. They’ve been on the Nintendo subreddit, mentioned here on Gaming Reinvented, posted on GoNintendo… heck, they’re so well liked that it’s gotten Shesez’s channel from 150 to over 9000 subscribers in half a year! Talk about an insane popularity boost! And now, we’ve got an exclusive interview with him. So sit back, relax and see how those interesting Boundary Break videos originally came to be! 1. So, let’s start out as usual here. Can you tell us a bit about yourself? Who is Shesez when he’s at home anyway? Shesez is my online persona. In real life at home I go by the name Derrek who absolutely loves video games more than any other hobby. It all started when I told my then girlfriend at the time that I was planning to entertain on YouTube. That I had strongly defined opinions and knowledge about video games and I wanted an outlet to share them. She then suggested we do a “boyfriend Girlfriend” channel. Which I was very interested in given that I didn’t see many channels like that back then. However, the my goals and drive were stifled by creative differences. And when we had finally broken up, I changed the password, changed the name, and changed the identity. At that time I believe we only had 150 people subscribed which i thought was enormous and didn’t want to abandon hahahaha. 3. Either way, your channel became much more well known after the first Boundary Break episode was posted. How did you feel knowing you’d stumbled onto a successful formula for a series? I felt I found a purpose for sharing videos to the gaming community. People we’re coming to see my videos because I offered something we’ve all wanted to see before. And I felt very thankful and privileged to be the one to deliver that content. 4. Some general Boundary Break questions now. Out of all the games you’ve covered, which were the most interesting to look at and why? Melee definitely had the best content. Seeing “SMASH BROS” hidden all over the menus and how some of the stages worked, was incredibly interesting. It was that sort of detail you hope to find that for some reason we were never able to see. 5. How about the least interesting? The ones without anything too unusual outside of the typical camera view? The Mario Kart episode was a real challenge. But by far the hardest to produce new and interesting content for was Pikmin. I combined two games, showed all beta areas, showed some fairly uninteresting content just to pad out a moderately sized episode. 6. Did you ever scrap an episode because it wasn’t working? Like, where the developers didn’t put anything interesting in the game (that you couldn’t see normally)? I have! Pokepark Wii was the first example of this. There was just NOTHING going on with that game. 7. I also remember you saying Wii U hacking wasn’t quite there for a Boundary Break episode yet. Did that ever get fixed? Is there now a better free camera mod for Super Smash Bros for Wii U? As far as i know there haven’t been any developments. I have tried commissioning modders but there doesn’t seem to be an interest there. I think I just have to luck out and make a fan out of a very intelligent programmer hahahaha! 8. And talking of that. What happened to Game Tour anyway? Was that the only episode? I have put out two episodes of Game Tour I think. Smash Bros and Twilight Princess. The concept was to do loose commentary and show off some less interesting bits. However, it was still kind of time consuming and people would gloss over them. So instead, using left over footage for my Real Talk episodes became more ideal. I get to do what i like, and the viewer is incentivized to watch with the footage going on in the background. 9. Onto some future episode concepts now. Are there any games you really want to make a Boundary Break episode about in future? Like the new Smash Bros, Mario Kart and Paper Mario titles? 10. How about requests? Are there games you see requested a lot for this series? Shadow of the Colossus is a big one that I cant do at the moment. Others are Mario Kart 8 and Splatoon. 11. Outside of Boundary Break, you seem to be making a few more podcasts and opinion videos. Is that something you want to focus on a bit more in future? Yes absolutely. I have very passionate thoughts about video games. And if people begin to enjoy Shesez as well as Boundary Break. I would love to sprinkle in more of those types of videos. 12. Are there any other ideas for video series like that which you have planned for the future? Game Reviews is one I have my eyes set on for sure. Not looking to move in on anyone’s territory with hacks or glitches though. 13. General YouTube stuff now. What did it feel like when you started seeing your work posted everywhere? Like on major subreddits, GoNintendo and other news sites, etc? It was an incredible feeling. I’ve been self promoting myself on GameFAQS and Reddit a lot in the past. Always got shot down. So it was nice to see people do it for me and to see the gaming community accept it as well. 14. What equipment do you use for these episodes and discussion videos? Like cameras, microphones, etc? Tech stuff I might need to do some research on as some of it isn’t mine and the stuff that is I’ve owned for too long to remember. 15. And what other channels do you subscribe to on YouTube? Why? GC Positive, Michelle Heafy… I try to stay invested in the little guys because i am one. But i love bigger personalities like Swanky Box, Aurum, GameXplain, Some call me johnny, JonTron, Cinefix and James Rolfe. 16. Have you considered opening a Patreon account for your channel? That seems to be the rage with a lot of video creators at the moment. Or is YouTube’s channel support button enough here? I solemnly swear never to resort to patreon. However I may sell the Boundary Break T shirt because a demand is growing for it. Dropping a donation is cool but i don’t want to stain my videos with plea or a beg at the end. Selling a T-Shirt feels more respectable. You’re not giving away your money to me. You get something you want and coincidentally it helps me out too. 17. How about YouTube monetisation? Did you decide to partner with a network or become an independent YouTube partner? 18. A few non YouTube questions now though. What games are you playing at the moment? How are they? Ace Attorney 5! Its… not as good as the original trilogy but I’m sticking with it. Bravely Seconds on the back burner but its a goodie! Cant wait to give Gears of War 4 a shot. Aaaaaand still trying to beat Dark Souls 3! 19. You also seem to focus a lot on Nintendo games with your videos. Do you prefer playing them to games on other systems? Love Nintendo with all my heart. And its that love that makes investing 40 hours of work a week to produce a BB for those classics a breeze. 20. Finally what advice would you give aspiring YouTube creators for making their videos more popular? Try to find something that people are looking for but they don’t know that they want it. REALLY put serious thought in how to market (eww hate that word) it. Also important, try not to be too fake. But put some thought into sounding entertaining. Don’t drone. Don’t be devoid of humour. But also don’t try too hard. Most importantly though, invest in doing something that you would want to see from a stranger. Don’t be too invested in yourself, be invested in what you like about YouTube. And so that ends our interview. Did you enjoy it? Learn anything interesting about Shesez or his Boundary Break videos? Either way, post your thoughts on the forums and social media today! Let’s Interview: NoClip.Website Creator JasperRLZ! Let’s Interview: Unused Content Video Creator Dr Lava! 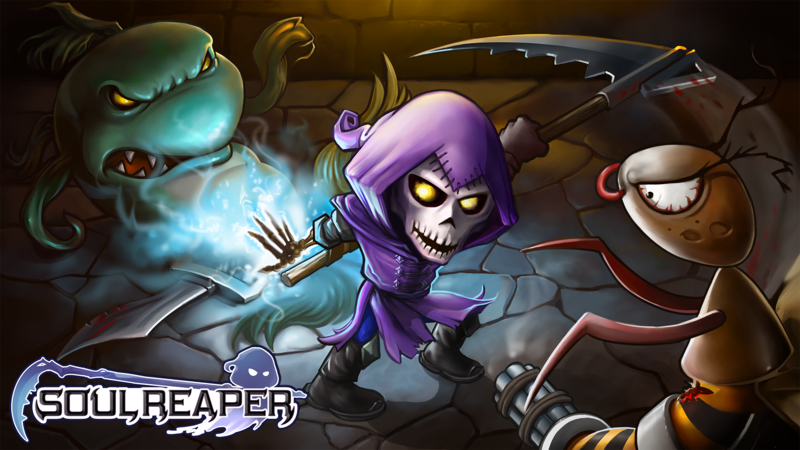 Let’s Interview; Soul Reaper Developer Power Level Studios!